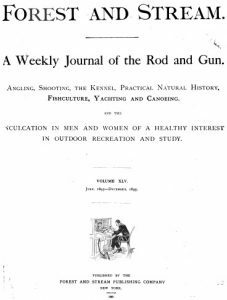 Click on the link below to explore the fourth article from a series published in Forest and Stream titled: How Fur is Caught IV 1895. Most of the article is based in the Winchester and Presque Isle areas with detailed accounts of trail blazing, running a trap line, winter shelters and surviving the cold of the Northwoods . Fay Buck’s legend grows as a trapper and guide. The descriptions of the Turtle Portage Band of Ojibwa (Mercer WI) is most insightful, though the author confuses the American Indian band as Winnebago. Editor’s note: please be aware, some articles from How Fur Is Caught, contains nativist and racist comments, sadly typical of early authors. Additionally, some may find offense regarding late 19th century trapping and wolf mitigation practices. The MWHS chose to preserve these early articles unedited with a cautionary note allowing the reader full context, and the option to skip offending text.